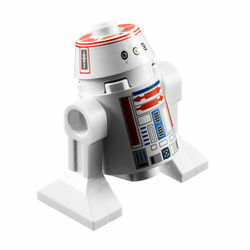 R5-D8 is a Star Wars themed minifigure released in 2012. R5-D8 has two plain white astromech droid legs, which connect to a white body. The body has printing on the front, primarily red, blue and grey in colour, all representing various compartment doors and components found on an astromech droid. On top of the body piece sits a white R5-series head, which features printing all around, most noticeably a red printing at the top of the piece, following R5-D8's predominantly red colour scheme. The piece also has black and grey printing for depicting sensors and other modules that the droid is known to have in the Star Wars universe. R5-D8 was an R5-series astromech droid owned by Jek Porkins. The droid participated in the Battle of Yavin as Porkins' X-wing co-pilot, but was destroyed along with the X-wing and Porkins when hit by a turbolaser. R5-D8 is one of the first three minifigures to be released with an R5-series head, the other two being R5-J2 and R5-F7. R5-D8 in LEGO Star Wars: The Force Awakens.